At each visit, you can earn multiple Khan Coins. You must have good oral hygiene and no broken brackets to participate in the Khan Coin Reward Program. Program starts once in braces and ends the day of removal. Coins may be cashed in at any time for cool prizes from our trophy tower. You also have the option of purchasing coins in case you are a few coins short of the prize you desire. We hope you will have as much fun with this program as we will! 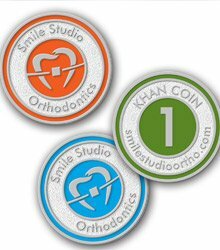 Make sure to brush and floss thoroughly every day so that you can start earning Khan Coins! Good luck!